My biggest concern about the milk we were drinking was if it came from cows that were being fed grass. I did a post awhile back entitled “You are what you eat eats too”, and this couldn’t be more true when it comes to milk. Cows are actually designed by evolution to eat grass, and a large majority of factory-farmed cows are instead taught to survive on corn (a super cheap grain). In some instances the corn makes the animals sick, which is part of the reason why they have to be administered so many antibiotics. Now if you are buying organic milk you obviously know that the cows have not been given any antibiotics, but being organic doesn’t necessarily mean they have been fed grass (or anything green for that matter). For all I know they’ve just been fed organic corn. 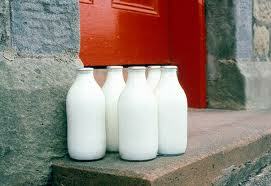 But, the point is that I really didn’t know what the cows were eating when I would pick up a jug from the supermarket. Even as I proofread this article now I have to admit it sounds a little over the top to care so much about what the cows eat before I would even drink their milk, but it really is important. The health of the cow greatly affects the health of their milk (as well as their meat products), and I am obviously on a mission to provide the absolute best for my family. One other thing I learned more recently is that skim milk may not be the best choice for my husband and me (our girls drink 2%). This came as quite a shock, because I drink a lot of milk myself and have chosen skim for as long as I can remember. According to our milk delivery service, skim milk is everything leftover after the cream has been removed in a separator. And apparently the cream is what contains enzymes and fat-soluble vitamins. So just like the process that white flour goes through (since removing the bran and germ also removes all the good stuff from the flour) the milk is fortified with vitamins in an attempt to add back what has been lost. So once again I think the better choice is to just consume the good stuff the way nature has provided it to us and not opt for something that just emulates the good stuff. To make dairy products low fat, it’s not enough to remove the fat. You then have to go to great lengths to preserve the body or creamy texture by working in all kinds of food additives. In the case of low-fat or skim milk, that usually means adding powdered milk. But powdered milk contains oxidized cholesterol, which scientists believe is much worse for your arteries than ordinary cholesterol, so food makers sometimes compensate by adding antioxidants, further complicating what had been a simple one-ingredient whole food. This once again reminds me how happy I am to be buying our milk from a reliable and knowledgeable source, which allows me to continue our theme here of knowing exactly where our food comes from! I was very excited today when I was out and about and saw a little store that had blueberries on sale 4 for 5 dollars. So I stopped to buy some. It was this cute store about 10 min from my home and it had tons of produce from and milk from a nearby farm. I asked if the cows on the farm were fed grass and the people said yes and went on to tell me all about the little farm and told me I really should go visit it. It seems every time I try to buy things locally, the people involved in the process are so proud of their farms and everything that they too want you to see where your food comes from. I think being resourceful we can all find ways to buy milk and other food in a more natural way. I hate milk and so does my family so we don’t drink much of it, but at least what we use in our recipes and such will be a lot better for us. That is so true about how proud the local farms are of what they raise/grow…and I love to support the great work they are doing! There is some concern that milk after age 2 may be detrimental to our health with increasing risk of otitis in children, DM (secondary to overactivity of the pancreas in its attempt to produce enzymes to digest the pasteurized milk), obesity as well as gastrointestinal toxicities. Also, much of the calcium we need can come from vegetables. Interestingly, we are concerned with getting enough calcium in our diet; however, countries in Africa and Asia with lower milk consumption have less incidence of osteoporosis; with the thought that the high protein in milk binds to calcium from milk, removing it from the body…possibly increasing risk of arthritis. Thanks for the opposing argument…it certainly makes you have to think for yourself once you absorb all the info that is out there. How quickly does the milk expire? Have you ever ordered eggs or cheese from them? Hey Elizabeth – They say the milk’s peak performance is about 7 – 10 days which we have found to be true. One thing we learned is that it is important to make sure your fridge is set at 37 degrees or cooler and to not store the milk on the door of the fridge (which is a noticeably warmer spot). Milk is the only thing I have ordered from them (I get my eggs and cheese from Matthews Farmers Market or CSA box). I highly recommend using Lakeview for milk and you could certainly try other stuff from them too…we have been very pleased so far and I love being able to support yet another local farm! This was very interesting. I was wondering if you have done much research on raw milk. I am very interested in natural and whole foods nutrition, and I have started to read quite a bit about the controversies of raw milk vs. pasteurized milk. It seams that pasteurization and homogenization of milk takes out at almost all of the enzymes, at least half of the vitamins, and changed to composition of the fat particles to be more toxic to arteries and veins. I was wondering what your perspective is on this matter? It seams to be one of the most debated topics in food every. I tend to lean more towards the side of the more natural the better, but I always love to hear what other people think. Hi there – Yes, I have researched raw milk and it is actually illegal here in North Carolina. It is true that pasteurization not only kills the dangerous bacteria, but it also kills some of the good stuff like you mentioned. The milk we drink from Lakeview actually goes through a process called “slow pasteurization” instead of “ultra pasteurization”. This means it is pasteurized at a slightly lower temperature than what you find with most grocery store varieties. So it is safe to drink, but still has some of the good stuff left in it. Even if raw milk were legal here I don’t think we would drink it, and I certainly wouldn’t give it to my kids (for the same reason I wouldn’t want them to eat raw eggs or raw meat). I hope that helps! It was great to meet you the other night. Congrats on all your accomplishments. We order from Lakeview as well. Been very pleased so far, and I highly recommend them to your readers. Keep up the great work and thanks for your post! Thanks for the comment and book suggestion Nathalie! I’m new to all of this and have really learned a lot from your blog- what is your opinion of Soy milk? Hello there! Two questions for you first…what are the ingredients in your soy milk (some have sweeteners and other additives)? And why do you chose it over dairy (is it an allergy)? Lisa- since reading your post, I have been so extremely interested in getting grass-fed milk that today I conducted my own research on where I can get some in my area (Southern California). I came upon this website that talks about their pasture fed cows, and how its not natural for cows to be grass-fed year round. This farm was not alone in its stance, in my research I read a lot of farms’/dairy websites that had similar feeding techniques. What do you think of it? Are Claravale Farm’s cows totally pasture fed? No. We feed our cows a traditional diet of hay, feeds, and pastures. Claravale Farm is a traditionally run dairy and we don’t think total pasture feeding of dairy cattle is appropriate for a number of reasons. Contrary to popular belief, total, year round pasture feeding is not natural for cattle and is not the way in which dairy cattle have historically been managed. More typical is for dairy cattle to get access to some pasture during the natural growing season (winter and spring here) and to be fed mostly hay, grain and other produce during the rest of the year. This is what we do at Claravale. In this way, farmers have historically taken advantage of natural yearly cycles of rainfall and production. Year round pasture feeding of dairy cows requires the artificial creation of year round pastures by intensive irrigation, which requires energy and water, both limited resources in California. Lisa – This sounds similar to the place that we use (their cows are not 100% grass-fed year-round either), and I think the important thing is that the place you found has obviously put a lot of thought into how their cows are fed/handled (in addition to feeding them grass when appropriate). After scanning their site I think it sounds like a great alternative to milk from the supermarket…thanks for sharing and good luck with it! Wow, that is very interesting. I have only read up on it a little bit, and once I learned that it could be harmful (like raw eggs or raw chicken) and that it is illegal I just kind of stopped there. Thanks for sharing this additional info with me though…I always love to hear the opposing argument! Oh one more thing.. did you buy the homogenized milk from Lakeview? When I bought the raw milk last week, it was of course not homogenized, and that’s how I was able to make my own butter. I meant to mention that there is a lot of controversy about homogenization too, since they alter the milk in order to make all the fat molecules the same size. They really know how to make natural milk and unnatural processed food! This was a really interesting read, thank you. I try and keep a close eye on what comes into my kitchen, but I hadn’t given my milk much thought. I try to buy organic when I can, and Skim. I will definitely switch to a full cream milk now. We don’t drink a lot of milk in our house, as I don’t believe it’s good for my daughters asthma, so I really don’t need to worry about the fat content. I don’t see organic milk available through the Lakeview link. Please clarify. How did you search for a local source? I would love to give this a try. I have been getting bread from Great Harvest by the way. Over the top yummy. Thanks for the tip. I just googled terms like “milk delivery service” and “grass-fed milk” along with our location of course. Good luck with your search and glad to hear that Great Harvest has worked out for you too! Glad to hear it was helpful information…thanks for the comment! We buy all our raw milk from Tucker-Adkins Dairy in York, SC (found them via the Weston-Price website a year ago). The cows are grass fed and are right there for you to see when you pick up your milk. Carolyn is a great local farmer and very easy to deal with. I’ve been a happy customer for the past year. I have three boys and they love the milk and are heavy milk drinkers. We generally buy six gallons a week! After hearing everyone talk about it I do feel a little tempted to try raw milk…but at the same time still feel uncertain about the dangers it might pose (especially for children) due to the supposed risk of harmful bacteria! Lisa- there has been controversy here in MN regarding raw milk…here is a link to a story about a local raw milk distributor and an E. Coli outbreak. I believe raw milk can be good but I agree with your decision not to give it to your children. Sometimes it is better to be safe than sorry. We’re not big milk drinkers here, either. Every morning I make a berry smoothie and use almond milk. My son is allergic (anaphlactic) to dairy, so he uses soy. However, we (my husband, daughter and myself) really like cheese. It’s really hard to find organic cheese unless I make a 40 minute drive to Wholefoods. Apparently people tell me it is really easy to make your own cheese…have you ever considered that as an option? I live a bit out from the city and one would think that finding farmers would be easy, however it is not! I have struggled with the milk issue for several years. I switched to organic milk from the store, but then read many things that it wasn’t what it was suppose to be and I was wasting my money. I did meet a farmer the other day that wanted me to try goat milk. It is illegal, however, it is growing in this area. They say it is better for you and easier for you to process. It is also suppose to help with ear infections which my kids get all the time. Any comments?? One more thing…I live to far out to get the great bread. Any suggestions for those of us who have to rely on Kroger’s??? Also, in regards to bread if you find a good source it will most often freeze beautifully…so make a drive 1/month and stock up! Or I have heard from many people that a bread maker can make baking your own whole-wheat bread easy (and cheap). As I began reading this, I was dismayed to see that you were apparently touting skim milk. I was then relieved when you repented that folly. To paraphrase your statement about cows, people are actually designed by evolution to consume fat. What is more, we were designed to consume animal fat, not processed vegetable fats. Contrary to widespread belief, animal fat can’t make you fat. Period. In fact, whole milk must contain at least 3.24% milkfat. Only1.24% more than 2%. I suppose there may be some out there with a little more, but not much, as that milkfat goes into making the more profitable items, like butter and cream; most farmers are not going to “waste” it by letting any more of it go directly to the consumer in cheap milk than they absolutely must. And whole milk just tastes so much better. I really pity the people who have become so conditioned to disliking fat that whole milk tastes “gross” to them. If you believe in evolution, you would have to know that our bodies were not designed to efficiently consume meat or fat but vegetables…. and I’m 100% meatatarian.. but just look at the difference between the stomach/digestive system of a dog, or bear, any carnivore, and compare to human.. dude, it’s crystal clear. First I wanted to thank you for taking yourself and your beautiful family on this journey. I was born in Czech Republic and “whole foods” eating was part of every day life. We made everything at home, every day was fresh meals, and we would never eat bread that was more than a day old. My grandparents maintain a huge garden so we always had plenty of fresh fruit and vegetables. Starting in spring until the fall, we were canning, drying, freezing and making jams out of everything possible. And that’s what we ate during the winter time. So needless to say, this lifestyle comes very naturally to me. I just can’t believe in the 10 years I’ve lived in this country I got so “sucked” into the American way of eating. My husband is still very much influenced by the commercials and the labeling that promises to lower your cholesterol or help your heart. It is not an easy task to convert him. But I must say that last year when we visited Czech Republic, he loved the chickens running around – his absolute favorite. I have been following your blog for over a month now, we watched Food Inc, after it was on Oprah so we were already familiar with the concept. We now cook and eat as much “whole and local” foods as we can. My husband even helps in the kitchen which has been a very nice bonus. He also brings lunches to work now, I think it’s because they just taste better than “eat fresh Subway” :-). This past weekend we were visiting my in-laws up in Maine and to my surprise found the loveliest farm called Harmony Farm. The chickens were running around and the goats were so cute. The owner Donna Marie is trying to put her farm together so she can get her Bed and Breakfast license. She wants to host re-treats on healthy eating etc. She also makes the best goat cheese…. I suggested she tries a “working farm” weekends. I was so happy to find her and even happier to be able to appreciate all the hard work that she does. Of course the eggs were amazing, the yolks bright orange. I am determined to have my mother in-law get her eggs there from now on! And we will be back every time that we go to Maine. I apologize for such a long post; I am just so excited to re-discover who I am in the kitchen and at the dining table. I believe what Lisa is doing is not only cooking and eating better, but she is instating values in her children that will stay with them forever. Congratulations and thank you again for drawing such great attention to something so important. Thank you so much for your comment! After reading about your life in Czech Republic you have inspired me to try to be better at storing (canning, freezing, etc.) fresh produce out of our garden when it is plentiful. I always enjoy “meeting” (and learning from) others who are equally excited about rediscovering real food. I live much further up in NC than you do and I’ve been traveling to SC to get raw milk for several years now. I used to get it through Milky Way farms, but switched to Tucker Adkins farms after a friend of mine that lives in Charlotte started getting their milk. My children and I like it even better than the Milky Way milk and it keeps a little longer. As to the worry for your children, I can understand your concern about giving them things we’ve been told for years are unsafe, but I can assure you raw milk is not a bio-hazard in the making – unless it’s handled improperly, but that is true with all food. I drank raw milk for several years when I was a child (before we moved to the city), and my children have thrived on it now for several years. I hope you’ll give the raw milk a chance. I found the website below useful when evaluating organic, store-bought milk options – unfortunately not all organic milks are the same….